I was delighted to be invited by Vivarail to a demonstration run of their battery operated Class 230, 230002 - the UK's first mainline production battery train - on the Bo'ness & Kinneil Railway in October. Vivarail is producing new trains from ex-District Line D78 stock from London. The original electric motors and bodyshells are kept, a modular power supply system is installed and the interiors are totally redesigned to meet operators' requirements. 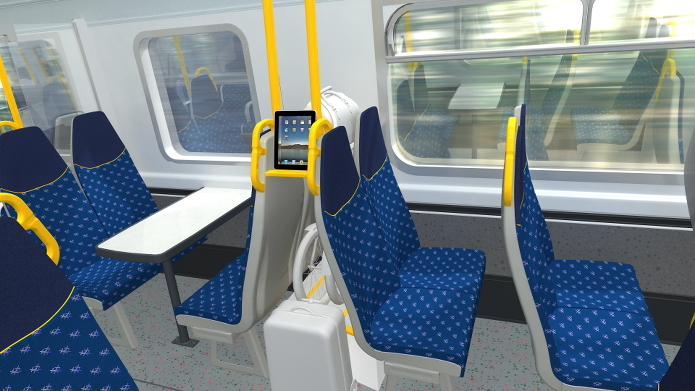 Vivarail Artist's Impressions: Looking the Part - this, and below. Readers may remember a reference to these trains in FNE 74, May 2018, when I referred to possible use of one to provide a shuttle service at the Thurso/Wick end of the line. There are various thoughts about how to solve the current situation of passengers to/from Wick currently having to traverse the entire 6½ mile branch from Georgemas Junction to Thurso and back, as well as having to wait while the driver changes ends, all of which adds half an hour to every journey. The most useful, but expensive, option would be a new station at Halkirk, just south of GGJ, and the construction of a chord line to the Thurso branch, thereby making Thurso and Wick symmetrical in relation to the line south. In any case, my personal favourite idea is for there to be a regular Thurso-Wick service - reflecting incidentally the first railway to be surveyed in the area - the Caithness Railway in 1845. I believe that currently some mixed commuting is done between the towns: train one way, bus the other! It would be interesting to find out potential traffic for such a service - an ideal proposition for a battery powered Class 230 which would only need a rapid recharge after every round trip. Bo'ness was a good place for a demonstration of the power available using modern batteries, with the long gradient through woods as the line climbs from Kinneil to Birkhill. This presented no problem at all to the train which had to stick to the speed limit of the line. Vivarail Chief Executive, Adrian Shooter, told me that the climb could have been done much quicker had it been allowed! D-Train (Class 230) at Manuel. If you look closely you'll spot Frank Roach chatting to John Yellowlees, and Adrian Shooter in the hi-vis jacket! The modular power supply system that Vivarail has developed means that any combination of diesel, battery and, in the future, hydrogen can be supplied to suit the operating environment. As Vivarail says, "D trains run on electricity and don't mind where it comes from". When there is a combination of diesel and battery power units regenerative braking means that power provided by a diesel module to accelerate can be partly re-used via regenerative braking to recharge the batteries. Sampling the train was quite an experience and, as a Londoner, I found riding an 'underground train' whilst gazing across the Forth to Culross delightfully bizarre!